As you would seed him on a scale, he would weigh 180s pounds of of bone, muscle and fighting energy–a fine specimen of American manhood. 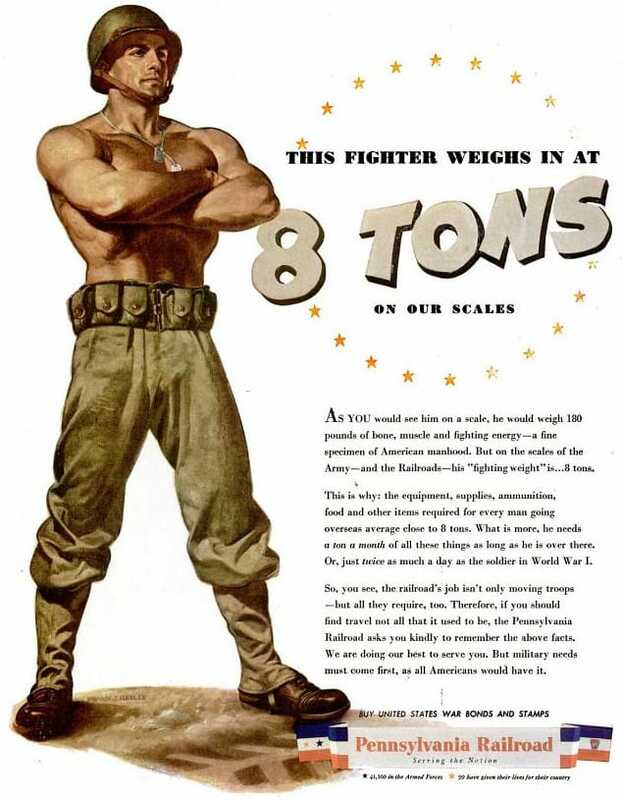 But on the scales of the Army — and the Railroads–his “fighting weight” is …8 tons. This is why: the equipment, supplies, ammunition, food and other items required for every man going overseas average close to 8 tons. What is more, he needs a ton a month of all these things as long as he is over there. Or, just twice as much a day as the soldier in World War I. So, you see, the railroad’s job isn’t only moving troops — but all they require, too. Therefore, if you should find travel not all that it used to be, the Pennsylvania Railroad asks you kindly to remember the above facts. We are doing our best to serve you. But military needs must come first, as all Americans would have it.